Now, these sittings will deal with the Revenue Commissioners primarily in the context of those provisions of the Terms of Reference which I have just mentioned. However, the evidence from the Revenue officials which the Tribunal expects to hear will also throw some light on other aspects of the Terms of Reference and in particular, Term of Reference (a) which deals with payments in the case of Mr. Charles Haughey, and in the case of Mr. Michael Lowry, the corresponding Term of Reference at Term of Reference (e). For reasons which have become all too clear in recent times, the Tribunal will be concentrating, in ease of Mr. Haughey, on the evidence relating to his affairs with a view to disposing of as much as possible of the evidence of Revenue officials relating to Mr. Haughey’s dealings with the Commissioners. The twin dimensional features of this evidence will become obvious when it is borne in mind that the manner in which a taxpayer treats his assets or his resources in the context of his obligations to the Revenue Commissioners may provide some useful evidence upon which to base the characterisation of the circumstances in which those resources were accumulated. And under Term of Reference (a), in the case of Mr. Haughey, what the Tribunal is required to scrutinize is not merely the fact of payments, but all of the circumstances in which any payments actually identified were in fact made. Term of Reference (j), the term dealing specifically with the Revenue Commissioners, involves an examination of the conduct both of the taxpayer and of the Revenue Commissioners themselves. In Mr. Haughey’s case, the Tribunal will be focusing on a number of different tax headings. These, more or less, correspond with the points of contact between Mr. Haughey or his agents, and the Revenue Commissioners over the 1970s, the 1980s and the 1990s. Much of the documentary material in relation to these tax headings or points of contact between the Revenue Commissioners and Mr. Haughey overlaps. Therefore, the Tribunal anticipates that it may take sometime before a coherent picture of the dealings between the Revenue and Mr. Haughey emerges and indeed, as the evidence proceeds, it may be necessary to introduce further portions of it by way of additional opening statements. It may also be necessary, in the light of information which becomes clear or in the light of the picture which emerges from the initial evidence, to recall a number of the witnesses to address matters which could not be addressed in the context of evidence given under one heading and which may require a witness to respond to queries which take into account information relating to a number of different headings. Under Term of Reference (j), the Tribunal is required to examine the Revenue treatment of payments identified by the McCracken Tribunal. That’s putting, in fairly simple terms, that part of Term of Reference (j) which I have already read out means. In addition, the Tribunal is also required to examine the Revenue treatment of payments found by this Tribunal that come within Term of Reference (a) or (e). The question which is posed by the Terms of Reference is whether or why the Revenue Commissioners did not collect tax from Mr. Haughey or Mr. Lowry in connection with any of these payments? The Revenue Commissioners have informed the Tribunal that until the McCracken Tribunal and the evidence and the report of that Tribunal, the Revenue Commissioners were not aware of any of these payments. Assuming that to be the case, the question for the Tribunal is whether, in all the circumstances, the Revenue Commissioners ought to have been aware of the existence of these payments; whether the Revenue Commissioners had powers which, if they were used properly, in relation to Mr. Haughey’s overall taxation affairs, they, the Revenue Commissioners, would have become aware of or been alerted to the existence of these payments; or putting it more broadly, whether the Revenue Commissioners would have become aware of or been alerted to the existence of facts which would have pointed in the direction of or which would have warranted further inquiry resulting in information leading to those payments. To this end, the Tribunal has determined that it should examine the overall relationship between Mr. Haughey and the Revenue Commissioners. And it is for this reason that it has been decided to approach the matter on the basis of the tax headings or points of contact I have already mentioned. The main headings under which the Tribunal intends to approach this are as follows: Firstly, personal income tax, secondly, farm tax or if you like, personal income tax arising out of farming operations; thirdly, capital gains tax; fourthly capital acquisitions tax, and lastly, residential property tax. In this opening statement, I am going to confine my remarks, Sir, as much as possible, to the relationship between Mr. Haughey and the Revenue Commissioners in the context of capital gains tax. Mr. Haughey had dealings with the Revenue Commissioners in the context of Capital Gains Tax in respect of two matters. They are, firstly, the disposal by him of a farm at Ashbourne, County Meath, known as Rath Stud. Secondly, a gain of some £300,000 arising out of a contract with the Gallagher Group in connection with the sale or purported sale of part of Abbeville. As the contract was not completed by the Gallagher Group, the £300,000 deposit was forfeited. It was a non-refundable deposit. As a result of the forfeiture or non-refunding of the deposit, effectively the entire value of the payment of £300,000 constituted a gain to Mr. Haughey and to his wife, Mrs. Maureen Haughey. The gain on Rath Stud arose from a sale in January of 1977. I think that gain was in the order of some £50,000. Where Rath Stud was concerned, the Capital Gains Tax was not in fact paid until in or around 1986. It would appear that no interest was charged and no penalties were levied in respect of this late payment. In the calculation of the tax due, Mr. Haughey was afforded the benefit of a discretion exercisable by the Revenue Commissioners so as to enable a taxpayer making a late return to avail of a more favourable method of calculation normally available only to a taxpayer paying his tax on time. Firstly, was there anything unusual by comparison with other taxpayers in the fact that the tax on this gain was not collected until some nine years after the gain accrued, in particular in circumstances where no interest was charged and no penalties levied? When I say was there anything unusual, what I mean to say is whether the treatment of Mr. Haughey’s case was by comparison with the general run of such cases in the Revenue Commissioners in any way more favourable or more indulgent? Next, was there anything unusual in the exercise of the discretion in favour of Mr. Haughey in respect of the making of a late return? In a submission from the Revenue Commissioners, the Tribunal has been informed that late filing was the norm for the vast majority of cases prior to 1988 and that penalty proceedings for non-submission of returns were taken only in a very small number of cases in each year. Although the Tribunal does not yet have available to it all of the information in relation to this aspect of the collection of tax on Rath Stud, it may be necessary to ascertain what sort of delay prompted the issue of proceedings in the cases that were mentioned in that submission. Mr. Haughey also incurred, according to the Revenue Commissioners, a liability to Capital Gains Tax in relation to the forfeited deposit in respect of the purported sale of 35 acres of Abbeville to the Gallagher Group under a contract of January of 1980. It will be recalled that it appears that these monies were used to fund the settlement of Mr. Haughey’s liabilities to Allied Irish Banks. It will also be recalled that evidence was given that the Receiver of the Gallagher Group took the view that the contract document under which this money appears to have been paid over was in a highly questionable form; that in view of the form of the contract, he considered that it was his duty as Receiver or that it might have been his duty as Receiver to seek to recover the sum of £300,000 purportedly paid under the contract on the basis that, in effect, the contract appeared to be a sham; and that, in addition, he canvassed this view with the Revenue Commissioners, bringing to the attention of Mr. Pairceir of the Revenue Commissioners, his own impressions, if you like, his unfavourable impressions of the contract document. The Revenue Commissioners determined to pursue the matter under the Capital Gains Tax heading only and were not prepared to appoint a liquidator to the Gallagher Group for what would effectively have been the purpose of challenging the bona fides of the contract. It would appear that no return of any capital gain was made in relation to this contract and it also appears that the matter may not have come to the attention of the Revenue Commissioners but for the fact that the Gallagher Group went into receivership and that the Receiver, for his own reasons, brought it to the attention of Mr. Pairceir, then Chairman of the Revenue Commissioners. The determination of the Revenue Commissioners to treat this under the heading of Capital Gains Tax resulted eventually in the making of an assessment in 1986. The tax due was assessed at £89,700. The assessment to Capital Gains Tax in respect of Abbeville and in respect of Rath Stud came in the aggregate to the total sum of £102,330. Of this, some £50,000 was paid in or about the 15th July 1986. It would appear that this payment was routed through Haughey Boland, Mr. Haughey’s then tax agents. It further appears that the payment was funded, as other evidence later on in these sittings will show, by a debit of £50,000 to the Haughey Boland No. 3 Account which was the same account used for Mr. Haughey’s bill-paying service, an account, the funds for which, were sourced through accounts under the control of the late Mr. Desmond Traynor. A second payment was made on the 27th July 1987 and this was in the amount of £25,000, again routed through Messrs. Haughey Boland and once again funded by a debit from the Haughey Boland No. 3 Account. The balancing payment was not made until January of 1988, which I think was in the region of eleven years after the liability arose. This payment does not appear to have been funded by a debit to the Haughey Boland No. 3 Account. Now, while these matters will have to be viewed or at least examined under a number of different headings as a result of other information which has come to the notice of the Tribunal and which will have to be ventilated in due course, one aspect of this payment that I should mention as an aside is that there does not appear to have been any scrutiny by the Revenue Commissioners of the source of the £102,330 required to discharge these tax liabilities, bearing in mind that in the years during which that payment was made, Mr. Haughey does not appear to have had any other source of income other than his payments from the Exchequer as a member of the Dail or as a minister or as a person in receipt of a pension, as far as the Revenue were aware. Were the Revenue Commissioners under any obligation to consider the unusual circumstances in which they became aware of the transaction whereby this gain was realised? Notwithstanding their decision to treat this gain as giving rise to a potential capital gains liability, were the Revenue Commissioners under an obligation to consider the unusual nature of the agreement whereby Mr. and Mrs. Haughey purported to sell part of the lands of Abbeville? We now know that had the Revenue Commissioners examined the circumstances of this agreement and, for instance, the fact that there appears to have been no attempts to enforce it on either side, either by the purchaser or the vendor, the question which arises is would the Revenue Commissioners have been prompted to scrutinize the payment and if so, would this have warranted further scrutiny by the Revenue Commissioners of Mr. Haughey’s affairs? One of the stated purposes for the payment of £300,000 was to assist Mr. Haughey in disposing of his Allied Irish Bank debts and, in circumstances in which it would appear that the agreement was a highly unusual one, the question which arises is whether this would not have prompted further scrutiny by the Revenue Commissioners of Mr. Haughey’s overall finances which, as we know, according to the Revenue Commissioners, consisted of nothing more than his State emoluments. Although the Revenue determined to treat this agreement as giving rise to a capital gain in the ordinary way and while it appears that there may have been very good reasons why this should have been done as a means of collecting some tax, a question which also arises is whether this decision to proceed in this way have precluded the Revenue Commissioners from forming a view as to the somewhat unusual circumstances in which the gain arose? In other words, even though the Revenue Commissioners decided that they would treat this as a capital gain and seek to collect taxation on it, was there any reason why the Revenue Commissioners should not have looked behind the gain and examined the circumstances in which it arose in order to form a picture of the activities of the taxpayer? Once again, having determined that the transaction should be approached as giving rise to a capital gain, a further question which arises is as to whether the Revenue Commissioners ought to have charged interest or levied penalties and whether, by not charging interest, and by not levying penalties, Mr. Haughey was being treated in any way differently from other taxpayers? Lastly, the Tribunal will wish to know why it was that an assessment of a taxpayer to tax and the collection of that tax was a matter with which the Chairman of the Revenue Commissioners appears to have been intimately involved? 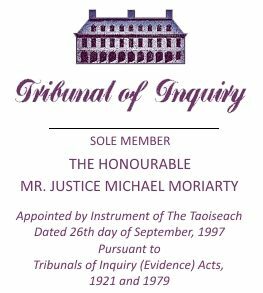 In particular, the Tribunal will wish to know why it was that the Chairman should interest himself in the affairs of an ordinary taxpayer, in particular, when it is assumed that the Revenue Commissioners did not see that taxpayer’s conduct as warranting any special inquiry, as warranting the charging of interest or as warranting the levying of penalties? I don’t propose to make any opening remarks at this stage, Sir, in relation to the other tax headings, though it may be necessary in due course to make a further opening statement at a later point in the course of these sittings either this week or at some other time. CHAIRMAN: Very good Mr. Healy, we will proceed to evidence, thank you.